Update at May 15, 2014: Somatization disorder, listed as a uniquely coded child category under parent, Bodily distress disorder, has been removed from the Beta draft Linearizations since publishing the update on May 9. Instead, the ICD-10 legacy terms, somatoform disorders and Somatization disorder are both now listed under Synonyms to Bodily distress disorder and also listed as Index Terms. The three severity specifiers for BDD, (Mild, Moderate, Severe) remain. Neurasthenia, listed as a child category under parent, Mental and behavioural disorders, has been removed from the Linearizations and is not listed in the PDF for the print version of the Alphabetical Index. Update at May 9, 2014: Three uniquely coded severity specifiers (Mild, Moderate, Severe) have now been added back as child categories to Bodily distress disorder but Somatization disorder remains as a uniquely coded child category to BDD. As no new posts will be added to the site from April, I leave you with my 12 Point Skinny on ICD-11 first published in February. The version below has been updated to reflect changes since February. A brief summary of how things stand in the Beta drafting platform at March 31, 2014. 1. The ICD-10 terms, PVFS, BME, and CFS, are not currently displaying in the public version of the Beta drafting platform under any chapters, either as ICD Title terms, or as Inclusion terms to ICD Title terms, or under Synonyms to ICD Title terms. 2. On Feb 12, 2014, @WHO Twitter admin stated: “Fibromyalgia, ME/CFS are not included as Mental & Behavioural Disorders in ICD-10, there is no proposal to do so for ICD-11”. This position was additionally confirmed by Mr Gregory Härtl, Head of Public Relations/Social Media, WHO. 3. Other than this position, WHO/ICD Revision has yet to clarify how it does propose to classify PVFS, BME, and CFS within ICD-11, in terms of intentions for specific chapter locations, parent classes (including any proposals to assign any of these terms to multiple parentage), hierarchies, Definitions text and other “Content Model” descriptive parameters. 4. Since June 2013, multiple requests have been made to WHO/ICD Revision to account for the current absence of these terms from the public version of the Beta draft and to issue a statement clarifying intent. On March 18, 2014, a joint letter was sent to key WHO/ICD Revision personnel . 5. Two separate working groups have been appointed by WHO/ICD Revision that are advising on the revision of the Somatoform disorders categories. 6. In 2012, two sets of emerging proposals were published – one for a tentative construct called Bodily distress disorder (BDD), and one for a divergent construct, tentatively called Bodily stress syndrome (BSS). 7. In 2012, the emerging proposals by the ICD-11 Expert Working Group on Somatic Distress and Dissociative Disorders (the Gureje led S3DWG sub working group) for its Bodily distress disorder (BDD) concept had described an SSD-like construct with criteria based on psychobehavioural responses . 8. In 2012, the emerging proposals by the PCCG (the Goldberg led ICD-11 Primary Care Consultation Group) presented an alternative Bodily stress syndrome (BSS) construct . 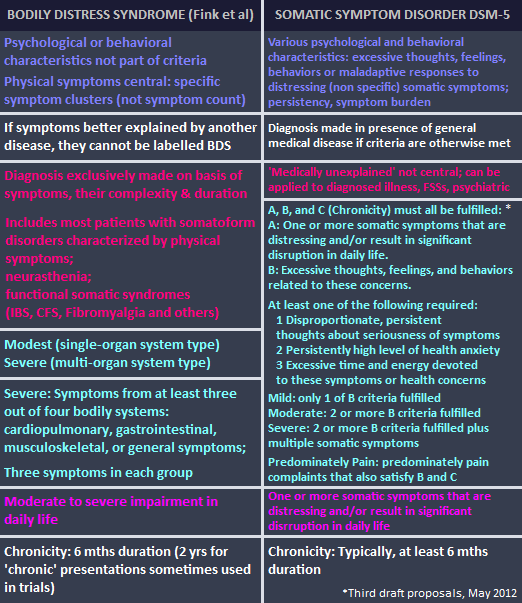 This proposal drew heavily on Fink et al’s Bodily Distress Syndrome (BDS) disorder model, requiring symptom patterns from body systems to meet the criteria. But the PCCG proposed to incorporate some SSD-like psychobehavioural responses, which do not form part of Fink’s BDS criteria – attempting a mash-up between two divergent constructs or disorder models . 9. The Definition for Bodily distress disorder (BDD) that is inserted into the Beta drafting platform  is based on the disorder description wording in the 2012 Gureje, Creed BDD paper, which had described an SSD-like construct . 10. BDD had a child category, Severe bodily distress disorder. This is now removed from the public Beta draft. Instead, ICD-10’s Somatization disorder has been restored to the draft linearizations as the child category to parent, Bodily distress disorder. Additionally, ICD-10’s F48.0 Neurasthenia has been restored to the draft, under parent, Mental and behavioural disorders. In the ICD-11 Beta, it had previously been proposed that seven ICD-10 Somatoform disorders categories (F45.0 – F45.9) plus F48.0 Neurasthenia would be replaced by this single new disorder construct, Bodily distress disorder (BDD) . But how these two (now apparently proposed to be restored) ICD-10 legacy categories, Somatization disorder and Neurasthenia, are currently envisaged to function within a new disorder framework to replace the Somatoform disorders categories remains unclarified. Neurasthenia, listed as a child category under parent, Mental and behavioural disorders, has now been removed from the Linearizations and is not listed in the PDF for the print version of the Alphabetical Index. 11. Without full disorder descriptions, criteria, inclusions, exclusions, differential diagnoses etc. or field test protocol, there is insufficient information in the public version of the Beta draft to determine the characteristics and criteria for whatever construct is being progressed to field tests; or to determine whether the initial field testing protocol represents the construct favoured by the Revision Steering Group (RSG); or to determine whether the two advisory groups and the RSG have reached consensus over the revision of the Somatoform disorders categories. 12. 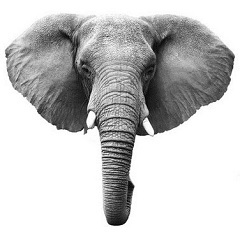 ICD-11 Beta is a work in progress, updated daily, and not finalized. Proposals for new categories are subject to ongoing revision and refinement, to field test evaluation, may not survive field testing, and are not approved by ICD Revision or WHO. 1. Joint letter signed by Annette Brooke MP, Chair, All Party Parliamentary Group on M.E., Countess of Mar, Chair, House of Lords-led group Forward ME, Dr Charles Shepherd, Medical Adviser of the ME Association, Sonya Chawdhury, Chief Executive, Action for M.E. Caveats: The ICD-11 Beta drafting platform is not a static document: it is a work in progress, subject to daily edits and revisions, to field test evaluation and to approval by Topic Advisory Group Managing Editors, the ICD Revision Steering Group and WHO classification experts.